When a Capcom public relations manager brings his A game to my Gamescom Marvel Vs. Capcom 3 session, my only possible line of defense is Squirrel Girl, a Marvel character so powerful she doesn't appear in the game. The Gamescom build of Marvel Vs. Capcom 3: Fate of Two Worlds isn't particularly new, but I've not had a chance to play any build, so I was sure as hell not going to pass it up because everyone else had already played it. Chun-Li, Super Skrull, Doctor Doom, and Trish were the latest characters to make it into the build being shown at Gamescom, so there was no Viewtiful Joe, or Thor, or Dormammu. This was perfectly fine with me, as none of those characters are in my Marvel Vs. Capcom dream team. No, that team is made up of Felecia from Darkstalkers, Deadpool, and Iron Man. Each were chosen specifically for their ability to look either cute and/or cool. It's a very scientific process, just like my fighting strategy. I am a world-class button masher. So you can understand my surprise when Capcom's Brian Kelter beat me in our first three matches. Is he supernatural? Is he a private detective? Holy crap, is he haunted? No, he's just a man, with a man's courage, and skills beyond my own when it comes to button mashing. There is only one defense against such a person: The Squirrel Girl defense. Squirrel Girl is a character from Marvel Comics that has the power to talk to squirrels and have them do her bidding. She has squirrel-like agility, a prehensile squirrel tail, retractable squirrel claws, and a strange sort of front squirrel tooth that can bite through solid skin, I suppose. Created in 1991 with a first appearance in Marvel Super-Heroes Special vol. 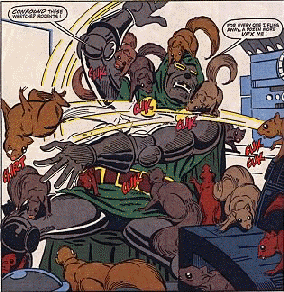 2 #8, Squirrel Girl and her squirrel sidekick Monkey Joe burst onto the comics scene, rescuing Iron Man from the nefarious Doctor Doom, by calling her furry friends to crawly all over his armor. Squirrel Girl later joined the West Coast Avengers, fight crime among such heroic figures as Flatman, Dinah Soar, and Mr. Immortal. Her sidekick, Monkey Joe, was killed in issue three. Doom still remembers his defeat to this day. It all went downhill from there. The possibility of Capcom Vs. Squirrel Girl came up, with character choosing to fight as either the entire Capcom character catalog or Squirrel Girl, was discussed, and while Kelter said such a game hadn't been "announced" by Capcom, his inflection clearly hinted that it might be possible, in some universe, somewhere. Note that the Squirrel Girl defense doesn't work in BlazBlue: Continuum Shift, which actually features a squirrel girl.